There’s another Apple software update coming down the pipe, and this one’s for an old favorite. 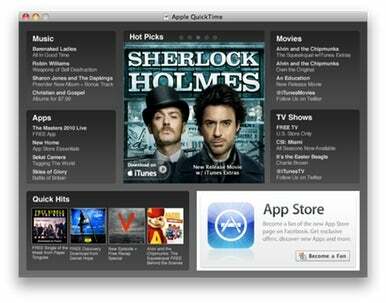 QuickTime 7.6.6 is for users of Mac OS X Leopard, Windows XP SP2, Windows Vista, and Windows 7. This update offers two tiny fixes for Leopard and Windows users, respectively. iMovie users can rest easy with the knowledge that QuickTime 7.6.6 offers “general reliability improvements”, while Windows users should see fewer issues involving playback of h.264 content on multi-core PCs. As for security fixes, QuickTime 7.6.6 has 16 of those, all of which address problems with “maliciously crafted” movies, audio or images that could potentially allow clever ne’er-do-wells to execute arbitrary code or unexpectedly crash QuickTime. On top of those welcome improvements, QuickTime Player 7 now has a brand new Welcome To QuickTime page that makes use of grey gradients to look a little more stylish than before—well, if you can ignore the garishly white ad to become a fan of the App Store Facebook page in the lower righthand corner. Snow Leopard users who were unhappy that QuickTime Player 7 was neglected with the lack of a 7.6.4 patch will be pleased to know that this update was rolled into Monday’s Mac OS X 10.6.3 update. Unfortunately, there is no 7.6.6 patch for Tiger users; looks like it’s time for the Tiger faithful to upgrade.